Get ready for Halloween with the Great Costume Halloween Ribbon. 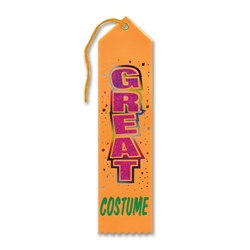 The Great Costume Halloween Ribbon are a must have for any costume party whether it's at home, school, or work. These ribbons are orange with cerise and green words that read "Great Costume". The ribbon also has metallic confetti graphics in the background. These ribbons are sure to be appreciated by anyone who put a lot of time into making sure that they had a great costume. Make sure to also check out the Scariest Costume Ribbon and Sexiest Costume Ribbon as well.